Sevylla has been studying and performing West African and Afro-Caribbean traditional music for 15 years, and has over 10 years experience working with “at-risk” youth. In 2000 she received certification in Afro-Cuban drum and dance from the Casa de la Cultura, Old Havana, Cuba, and returned to Cuba in 2001 for additional training. In 2006, she was commissioned to produce a “carnaval” float for the inaugural First Night Austin festival, a New Year’s celebration of the arts, and in the fall of 2008, was awarded a grant from the City of Austin’s Cultural Arts Division to bring drum programming to the Dove Springs community, which is now entering its 8th year, and has been featured on Austin PBS station KLRU, as well in the April 2015 edition of Austin Monthly Magazine. In 2013, and again in 2015, Roots & Rhythms was proud to be selected for a MindPop Grant through the Creative Classroom Fund. Sevylla holds a B.A. in Anthropology from UT Austin, and has been invited to speak at the UT Department of Theater and Dance; St. Edward's University; Mexic-Arte Museum; and the 21st Century “Hands-On, Minds-On” state-wide educators conference. Acoustic Jungle. This acoustic, all-instrumental Latin-Jazz trio features Ryan Waguespack on classical guitar; Greg Bumgardner on upright bass; and Sevylla on congas and percussion, and is available for public and private functions. 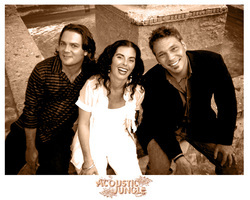 Check us out at www.acousticjungle.com. For bookings: Ryan Waguespack. The Drum Cafe. This international team building organization has been bringing people together to Unite, Uplift, and Inspire since 1996. 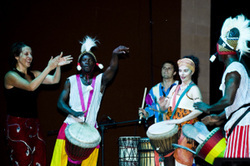 Using the drum to bring people together and illustrate the importance of working as an ensemble, they've been featured at the Beijing Olympics in 2008, at the World Cup in Africa in 2011, in Shakira's video "Waka Waka," and performed for Nelson Mandela, Bill Clinton, and many, many more. Sevylla is the senior Program Facilitator in Texas, leading the audience through this collaborative experience, as well as dancing, and playing accompaniment on djun djun and djembe. For bookings and more information, please contact Dale Monnin. Roots & Rhythms Cultural Arts Program. Building positive ties to local communities. Sevylla is the founder of this cultural arts and music education program, operating in the Austin area since 2008, thanks to an award from the City of Austin Cultural Arts Division. This world music, percussion based, educational program covers a broad spectrum of music from around the world; brings guest artists from the community into the classroom; offers field trip opportunities; and creates a socially themed public performance at the end of the school year. The program now serves children in four area public schools. To find out more, visit the Roots & Rhythms page on this website, or visit the full site at www.rootsandrhythms.org. Lannaya Drum and Dance Ensemble. Lannaya is a 501 (c)(3) non-profit West African drum and dance ensemble located in Austin, Texas, that performs authentic and progressive interpretations of traditional African dance, music, and folklore. Sevylla was a founding company member from 2000-2012, and served on the board of directors from 2009-2013 overseeing grant compliance and bookings. You can learn more about Lannaya at www.lannaya.org.